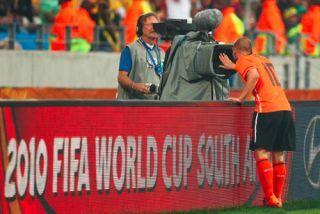 FIFA now reveals 8K TV production plans for 2014 World Cup | What Hi-Fi? In fact, football's world governing body is going to be working on 8K production of a "few matches" at this summer's tournament in partnership with Japanese public broadcaster NHK. According to Advanced Television, Niclas Ericson – head of FIFA's TV division – told delegates at the annual MIPTV event in Cannes that 8K production was in the pipeline this year. Ericson said: "With NHK of Japan we are also working on 8K production. This will include a few matches but is a very different arrangement, with a handful of cameras – only a few exist. "But it does mean that we can down-convert the 8K camera work to 4K, and make those images available for the 4K productions." Meanwhile, Ericson also shed more light on FIFA and Sony's planned 4K TV coverage at the tournament – particularly in relation to the possible broadcasting of the resulting pictures. "We hope that there will be a few Asian broadcasters, and then in the Middle East as well as Europe, [who] will take the 4K feed, as well as Globo in Brazil," he said. Under the proposals for extended Ultra HD 4K coverage of the 2014 World Cup laid out last week, FIFA and Sony confirmed that three games – at the Maracana – will be produced in 4K. In addition to the matches themselves, 4K TV technology will be used in the filming of the Official 2014 FIFA World Cup Film in order to "further promote the growth of 4K content". Sony will provide "extensive technical support", including the development of a 4K live production system. Equipment such as the CineAlta 4K live camera PMW-F55 will be used.